With just over a week left on our journey I pray you have come to see how much you are loved by God and how he wants you to know him, as he knows you. Have you accepted that you are in a relationship and not part of a religion? If you have moved this knowledge to your heart I can guarantee Jesus is rejoicing. You can rejoice too, at how far you've come, but be careful it is not for your own glory. It is tempting to congratulate yourself because you have done this study every day, you have been praying and you know you've grown in your relationship with God. It's a good thing, so celebrate but know your motives. Jesus tells the story of the Pharisee and the tax collector , coming before God in the temple (18:9-14). The Pharisee is a righteous man, reading scripture every day, praying and growing in his knowledge. He looks around and sees he is better than a lot of others. Your commitment and diligence is commendable but what have you been learning about relationship? 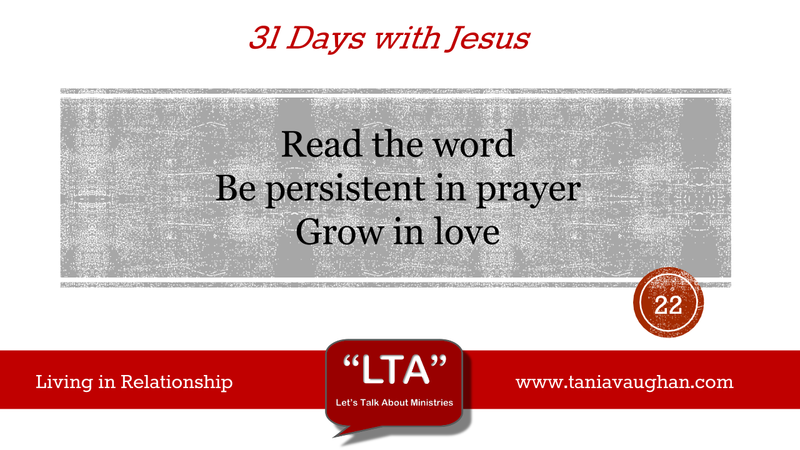 Are you imitating Christ, are you becoming more like him? The aim of this study is not to learn more scripture, create good study habits or gain more knowledge. Although these are all good things and I encourage you to continue you in them. The aim is to grow your relationship with God and in doing so grow in the fruit of the spirit and the likeness of Christ. The more you study, learn and pray, the more you should be recognising God's amazing mercy and love. The closer you follow Christ the more you should see the distance and recognise his great sacrifice in dying to bridge that gap. It is the tax collector that is justified by God, as he comes and bows in humility recognising his own short comings and unworthiness before a God who hears him. The growth in your relationship with God and the increase in your knowledge of scripture is not for you, it is to be used to show the Glory of God. What good is knowledge if you do not share it? Appreciate and be satisfied with the amount of Scripture you are reading, the commitment you have made and the habit of prayer you have formed, but don't be so proud of your achievement that you miss the reason for doing it in the first place. Lord, thank you for the way in which you have drawn me into a deeper relationship with you. I am pleased with the commitment I have made to this journey and all that I have learned, help me to focus on you and not fall prey to the sin of pride. I want to use all I am learning and my foundation in you to share with others and to show your glory in my life. Lord, I bow before you in humility, use what I know to further your kingdom. This is such a convicting series. Thank you for ministering to so many souls. Blessings! These are important verses! if we place ourselves above others it is pretty hard for us to fully experience the grace and love that JC has for us. It is easy to benchmark our own life against the worldly perception we have of the life of another. What we all forget is that we are not called to judge others but to be judged and it is by what is inside that we are judged on and how that is reflected in our witness that is important. Whilst you highlight the story of the Pharisee and the tax collector, also in these passages is the blight of the Rich man and Lazarus - another example of how humility can end up. I have mentioned previously I have come to understand my calling as a facilitator to further other peoples calling but it took me a long time to realize this. Ask yourself 'how effective will a worship leader be without the PA team to provide microphones and speakers?' Yes it is important to remain humble but it is just as important to know that JC can use you to further his kingdom.